July 14, 2015, Queens, NY In July of 1959, CBS produced a documentary about the Nation of Islam entitled, “The Hate That Hate Produced” which was produced by Mike Wallace (of 60 Minutes fame) and Louis Lomax. The documentary focused on what was thought to be a fringe militant group led by an elementary school dropout named Elijah Poole and boasted this fiery, charismatic minister named Malcolm Little. The title cast the Nation of Islam as a “hate group” that was responding to the racial bigotry of the times. Fifty-six years later, those with long-rooted and thinly veiled bigoted notions about race could not contain themselves regarding Serena Williams and her victory last weekend at Wimbledon. The win allowed Serena to complete the “Serena Slam” and put her one Grand Slam victory away from the Calendar Grand Slam. Before delving into the matter, let’s give Props to the Pops. Richard Williams, the father of Venus and Serena, deserves the lion’s share of the credit. It was his audacious vision to teach his daughters tennis even though he never picked up a racket in his life, and his prophecy that his daughters would be the best female tennis players ever has been manifested. (Please note: Venus is better than Serena; she’s been sick for more years than the public and media knew, for minimally a decade.) Richard Williams has become a footnote when he was the driving force behind their success. Serena is the greatest female tennis player ever. She’s better than Court (think Margaret), better than Graf (think Steffi), better than Navritalova (think Martina), and better than Evert (think Chrissy). The only player that could have been a serious threat was Monica Seles (before she was stabbed; I know this firsthand from Richard Williams). She’s bigger, stronger, faster, and yes, smarter. And, she handles adversity better than the aforementioned. She’s a product of great genetics and hard work. She wasn’t afforded the advantages that most tennis players just happen to inherit, yet she is far superior (as a tennis player). This past weekend, some of the most hateful comments were levied at Serena. The comments attacked her femininity and looks. Serena isn’t just muscular; she’s curvy. And therein lies the difference. I don’t have to show you the pictures; you’ve seen them. 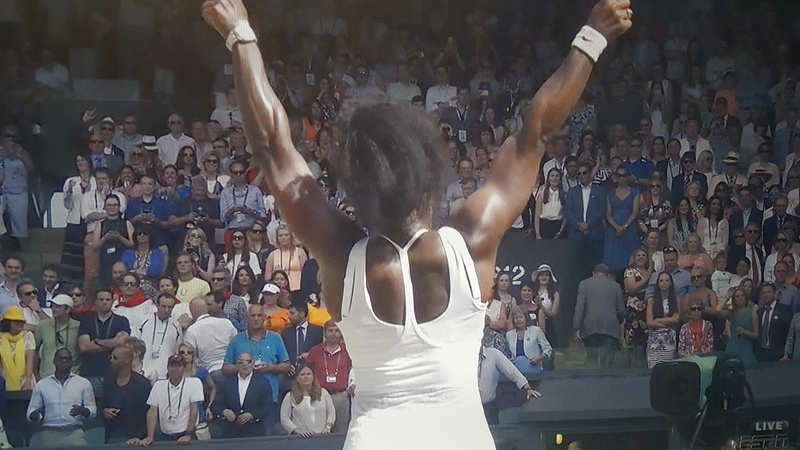 If you think Serena is manly, you may want to confer with noted novelist J. K. Rowling. And, in terms of her looks, I don’t see how this is even an issue. Serena is stunning (and you can examine her face, feature for feature). If you want further proof, look at Venus’ face. Look at the mother’s (Oracene) face. And look at the father’s face. Time has stood still. The hairstyles have changed but not the face. It’s obvious what’s fueling all of this criticism. It’s hatred. But not so much hatred of Serena as it is self-hatred. Yes the Hate that Hate Produced begins with hatred of self. And for all of the haters, get some help.